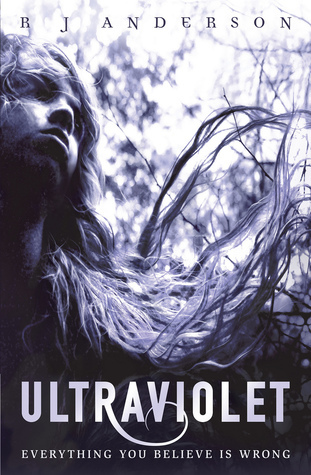 Ultraviolet isn't the book you expect it is going to be ... it's even better. It continually throws twists into the mix which change your perspective and keeps you guessing right through to the very end. I'm going to warn you now that this review is deliberately vague in places so not to spoil the twists for anyone. When you first read Ultraviolet the scene is set for one type of book. A young girl wakes up in an secure instuition for mentally ill people and you are told that another girl has gone missing. You don't quite know what is going on but the assumption is that the main character Alison has had something to do with the other girl's disappearance. You start to find out more about what happened and the new situation Alison has found herself in. It becomes quite clear soon on that something isn't quite with the whole situation and that everything isn't all that it seems. Alison maintains that she is totally normal and without need for medication and the specialists at the institution claim otherwise. It isn't until an external therapist comes to the centre to work with Alison that any kind of explanation for why she is the way she is starts to unfold and things start to get better for Alison. She is finally allows home for a short visit and it is during that visit that the whole story is thrown on its head with a twist I didn't see coming and changes the story to something else entirely. From the twist onwards the pace and feel of the story changes dramatically and it gets to the point where you don't want to put the book down. I really enjoyed getting under the skin of the main character Alison and following her as she found out more about the situation she finds herself in and works to get out of. The thing for me that made this book brilliant was the final chapter which in itself twists the story on its head again and leaves you wondering what it is you actually read and what actually went on. I've seen such a thing done in TV shows and films time and time again but never encountered it in a book which made it pretty special. It is the main reason why i think this is a book I will be thinking over for a long time to come. All in all an awesome book which I am sure I'll keep thinking about for a long time yet and playing over in my mind again and again. I just downloaded this from netgalley, can't wait to read it, I am so intrgued from the reviews I have been reading. Thanks. Great review, I totally loved this book. I get what you mean about it being one you continue to think about for a while! I read and reviewed this book on my blog last week, and I really enjoyed it. It was pretty cool to see a character with synesthesia, and it made for some wonderfully vivid descriptions. I think the author did a great job! I have this from Net Galley to read. I can't wait to get into it. So glad you liked this! I really enjoyed it as well! I talked to the author, and she said there might be a sequel. That would be so awesome! Nice review. I have been seeing this book floating around. I am glad to hear that it is a good book. I loved this one too, I couldnt put it down either and I loved the very unexpected twist! :D Glad you did too!